A recent North Dakota law passed in November 2012 now bans smoking from almost all public places and most workplaces in N. Dakota, including public transportation, nursing homes, motels, and bars. Smoking within 20 feet of an entrance to any public building is now against the law. Individuals who break the North Dakota smoking law will incur fines of $50. If a bar in N. Dakota does not comply, they can have their liquor and tobaccos license revoked. If you are a business owner or facility manager, Glaro smoker’s posts and cigarette receptacles are an excellent way to manage cigarette waste and organize smokers into designated outdoor areas. Manufactured since 1947, Glaro cigarette receptacles use recycled metals and they are built based on high standards of quality. They are known as sleek, modern and durable solutions for cigarette disposal that are easy to empty and very attractive aesthetically. Indoor and outdoor smoking receptacles are available. If you are a business owner and require metal smoking receptacles, call our headquarters (631-234-1717). We will recommend a distributor to you. If you are a dealer looking to distribute smoker’s posts in North Dakota, we welcome you to contact us and learn about our fast onbaording process. Glaro Smokers Posts are the original post style Cigarette Receptacles that have been emulated by many other manufacturers. The Deluxe Smokers Post cigarette receptacles present a sleek and stylish sophisticated design to satisfy the tastes of the leading architects and designers. This series of cigarette receptacles has maintained a reputation for being the most indestructible and best quality cigarette receptacles in the industry featuring a one eighth inch thick tubular body and an extra heavy weighted base. They are perfect for any public or private location in North Dakota. The floor model cigarette receptacles have solid steel weighted bases to insure their stability, unlike the plastic cigarette receptacles in the market today. The Value Smokers Posts are the alternative cigarette receptacles that have become popular because they are durable, weatherproof, fireproof, and also conceal odors. The Value Smokers Posts cigarette receptacles feature the quality of craftsmanship expected from Glaro. However, this line of cigarette receptacles is slightly lighter and is available in an additional number of models to choose from than the deluxe series. 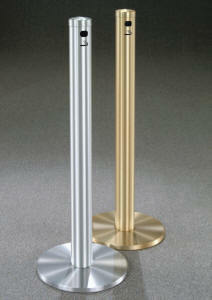 The Value Series of cigarette receptacles has succeeded in offering a sophisticated design at a reduced cost. 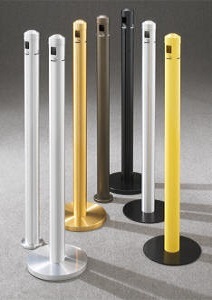 Glaro cigarette receptacles appeal to designers, architects, purchasing professionals, and building managers, people who appreciate having a selection of 29 cigarette receptacle finishes to choose from (satin aluminum, tarnish proof satin brass, and 27 textured and smooth designer powder coat finishes). All of these cigarette receptacle finishes will last indefinitely as they are baked onto rust proof aluminum that has been carefully prepared at our plant to insure a finish bond that is stronger than all other cigarette receptacles. All Glaro Smokers Post cigarette receptacles are available in floor, wall, and table top models. 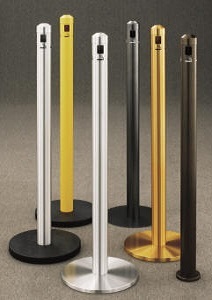 The floor models provide the flexibility of having a portable product yet some floor cigarette receptacles can be temporarily or permanently attached. Wall mounted cigarette receptacles are available in several sizes and can be securely mounted to the wall for convenience and security. Table top Smokers Post cigarette receptacles are ideal for cruise ships, pools areas, and outdoor patios and picnic areas. Remember that Glaro cigarette receptacles can be customized matched for color and design. Most importantly, Glaro Smokers Post cigarette receptacles provide you with the largest, most diversified “family” of products of their type. With Glaro Smokers Posts any facility can be properly equipped with a combination of matching floor, wall, or table top cigarette receptacle models. Glaro cigarette receptacles can be shipped from the New York Glaro factory within one to three days. In addition to all these fine points Glaro is one of the very few companies manufacturing fine products in the USA, providing jobs to Americans, and supporting the American economy.